When George Orwell decided he wanted to understand Britain's underclass he lived for a time as a homeless man and wrote about his experiences in Down and Out in Paris and London. In The Road To Wigan Pier Orwell travelled to the coalfields, went down a mine and lodged in a filthy boarding house. Even though he went to the most exclusive private school in England, Eton, Orwell writes with compassion and sympathy about the British working class because he lived with them, ate with them, grew to understand them. This is not expected of today's social commentators. In an editorial in yesterday's Daily Mail, Max Hastings, who went to Charterhouse labels the current British underclass as "yobs," and "wild beasts" among other things. In the comment thread underneath the article Britain's poorest people are described as "pond life," "scum," "animals," "vermin," etc. etc. Neither Max Hastings nor anyone else who writes for the Mail would ever dream of doing an Orwell these days. 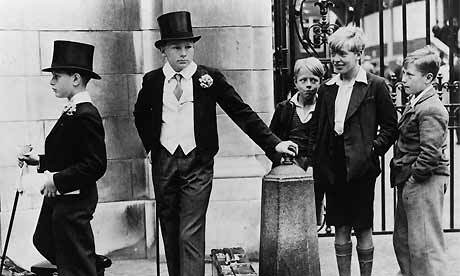 Britain's underclass are simply beyond the pale. Hatred for the working class prevails everywhere, both in obvious forms in a Mail comment thread and in more subtle ways in the books and films which are offered for our consumption by the private school elites. In an unintentionally hilarious paragraph Hastings laments the fact the working class don't seem to have even cared that much about the Royal Wedding. I deplore the looters, rioters and their actions but unless they are willing to attempt to understand the poor the people who went Charterhouse or Eton or Harrow have nothing worthwhile to say on this subject and can be safely ignored.